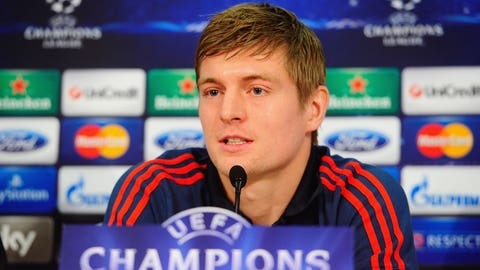 Toni Kroos speaks to the media ahead of Bayern Munich's Champions League round of 16 second-leg clash with Arsenal. Bayern Munich midfielder Toni Kroos has revealed that a move to the Premier League is a possibility this summer. The 24-year-old Germany international is one of the hottest properties in Europe and has yet to sign a new contract with Bayern. His current deal expires in the summer of 2015 and he has been heavily linked with a move to Manchester United. And, speaking ahead of the second leg of Bayern’s UEFA Champions League last-16 tie against Arsenal on Tuesday, Kroos suggested he could be tempted by a move to Old Trafford. "Nothing has been decided about my future," he said. "It’s no secret the Premier League is an option for me. "No one has come to any agreement and it will stay like this until the summer. "I think that anything is possible for me if I leave. I have to think about this for myself, and make the right decision." United may miss out on a Champions League place this season but Kroos said that would not lead to him automatically discounting the club as a possible destination. "I will consider everything," he said. "If I should leave." There is speculation in Germany that Kroos is simply angling for an improved deal from Bayern. And Bayern boss Pep Guardiola was quick to stress that he is keen for the player to remain where he is. "I have told him I can make him an even better player," said Guardiola. "I hope I will have him many seasons." Kroos already has 42 Germany caps and has been a key man for the all-conquering Bayern side this season, scoring in the 2-0 first-leg win at Arsenal.